Almost three months would pass before Pauling finally received a passport and made it to Europe. He was received to great acclaim as Honorary President of the Paris International Biochemical Congress, where his new combined status as scientific star and political dissident drew crowds of fans. He reviewed his ideas about protein structure before an overflow audience, then held court in his hotel suite with Ava Helen, where they received a stream of well-wishers. By now it was becoming clearer that some of his and Corey's ideas about structures other than the alpha helix and pleated sheets were in serious trouble. Rather than knuckle down to the painstaking work required to prove his critics wrong (a difficult task because they were not) Pauling's restless mind began casting about for new challenges. In France, one appeared before him: a long chain of nucleic acids with a long scientific name. Everyone called it by its shortened form, DNA. It was an important molecule in the body. 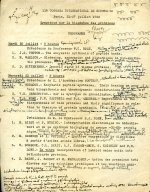 A few British researchers had been nosing about it; Alexander Todd, for instance, had written Pauling back in May "I hope you are getting interested in the macromolecular structure of the nucleic acids." Pauling knew enough about structures like DNA to know that the fibers could provide readable x-ray pictures. Corey, while in England in May, had seen some fine examples in the laboratory of a researcher named Rosalind Franklin. DNA was composed of a few repeating subunits called nucleotides. It looked like a solvable structure, and Pauling figured that sooner or later he would be the one to solve it. While in France in the summer of 1952, however, he became a lot more interested in attacking it quickly. About a week after the Paris Congress Pauling attended a meeting at an old French abbey devoted to studies of an interesting group of bacteria-infecting viruses called phage. There he heard important new evidence that DNA was more than just another molecular structure to solve. Two American scientists named Hershey and Chase presented data that showed that it was likely the stuff of genetics, the molecular source of heredity. From that point on, Pauling's focus shifted away from proteins and toward DNA. He began considering how to approach the problem. The way to solve DNA, he told a group at the French abbey, probably was the same way he had cracked the alpha helix: use precise x-ray work to map the structures of its nucleotide building blocks, as Corey had done with amino acids. Find out exactly how they connected to one another. Then make a model of the most likely long-chain structures that the building blocks would form. Among those listening was a tall, gawky young American postdoctoral student named James Watson. See Also: Pauling Diary: "France and England 1952 / Also Toronto." 1952. See Also: "The Forces Operating between Polypeptide Chains." August 6 - 8, 1952. 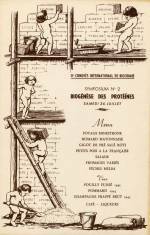 Pauling's annotated program from the International Congress of Biochemistry, Paris, France. July 26, 1952. Commemorative dinner menu. International Congress of Biochemistry, Paris, France. July 26, 1952.